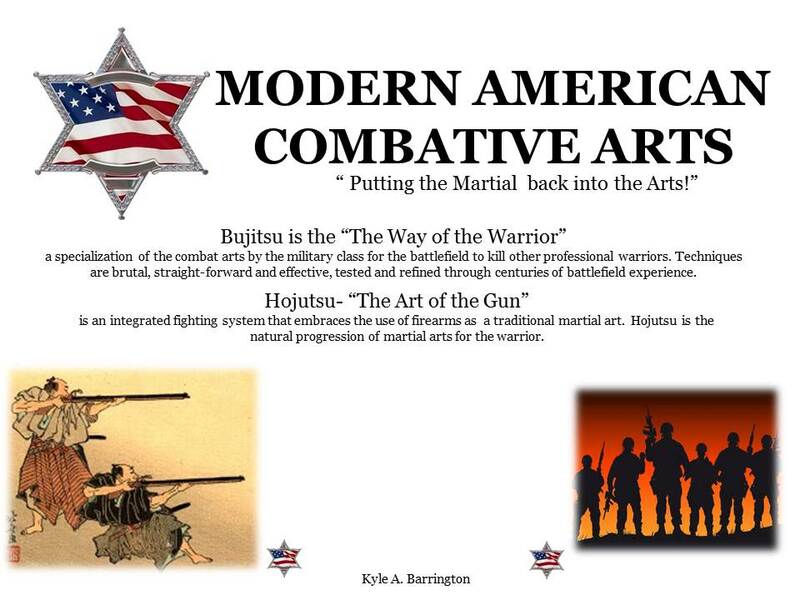 Martial Arts - Modern American Combative Arts Modern American Combative Arts;located in Woodbine Georgia is looking for Responsible Gun Owners that want to be Responsible Citizens! Get Quality and Responsible Training. We will provide you with world class instructors and instruction. Anyone looking for Basic Firearms training, Advanced Firearms training, NRA Certified Firearms Training, basic gun safety thru the principles of combat needs to contact us to learn or become a better shooter. Lets us help you reach your maximum potential. The Japanese Bujutsu refers specifically to the practical application of martial tactics and techniques in actual combat. Hojitsu is the adaptation to the firearm in feudal Japan. It is my opinion that the martial art instructor that does not account for modern weapons is preparing his students for defeat. The concept of weapons range is the ability to strike from the greatest distance possible. The Samurai of feudal Japan are known for the Hand to hand fighting skills. We must look at history and realize that these skills are deadly and violent because everything up to this point failed! The principle is to strike from the greatest distance possible. 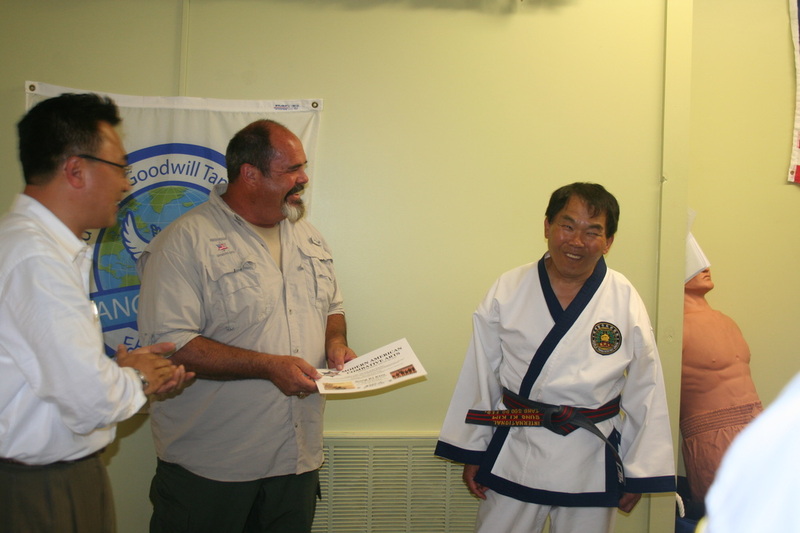 I have been honored on more than one occasion to have Grand-Master Song Ki Kim stay at my home in Woodbine Georgia. In the Tang Soo Do world he is truly unequaled in knowledge and position. This man has studied the Martial Arts longer than I have been alive and I still am amazed to watch him do things that most 20 somethings cannot duplicate. A man with this vast amount of knowledge truly understood and enjoyed his first day on the range since the Korean War period and was ecstatic to be awarded his White Belt ( 10th Gup) in the art of HoJutsu- " the Art of the Gun"
You, the combatant must clearly understand what constitutes your mission. Knowing your mission is also a principle. You must decide what your end state is. Your mind must go to where you want your body to follow. Know yourself! Your Mission: Prevent harm and the use of violence against you and yours. Fight the fight that affects you and yours! You are only required to fight only the fights that affect you and your loved ones. I will not tell you not to help others or insert yourself into a situation to protect others; I will tell you to check your local laws and to make an informed decision. In any situation where violence is being threatened upon you or your family, there may come a time when you must make the hard choice, at risk of injury to yourself and those around you, to take the fight to your adversary in a truly violent battle to the death. Or you can choose to capitulate to your attackers demands, knowing that once you have submitted, allowed yourself to be bound and gagged, the same adversary who invaded your home with violent intent, have nothing restraining them from doing whatever they wish to you and your family. Fight and you MAY get injured or you MAY die. Surrender and you WILL get injured... emotionally and physically. And whether you live or die will not be your decision. You gave up that choice when you submitted. Your fate now rests in the twisted mind of the career criminal standing over you and your family. The good news, as seen in the home invasions where the occupants chose to fight, is that you have the element of surprise because your attackers are expecting you to submit to their demands. Actions beats reactions every time, so when you decide to fight, launching a devastating attack quickly and ferociously, with no regard for your adversary’s well-being. Look for your target points, overwhelm them with aggression and don't stop your attack until the adversary is nonfunctional. If you have a gun and are trained, your attackers will not know what hit them. If you don't have a gun, get a gun and carry it with you, even in your home. Then get a Concealed Weapons Permit and carry your gun with you when away from your home. Know all your options and make the informed decision! If you make the conscious decision to act, you must act decisively.